Welcome to another blog by Aarif Deen. For more blogs, and EVERYTHING HOCKEY 24/7, follow me on twitter @NHLAarifDeenRep. Enjoy the read! Well here we are fellas. 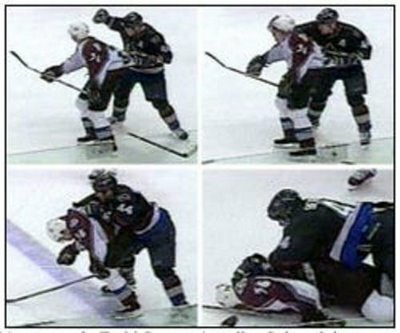 It has been eight years to the day Todd Bertuzzi shocked the entire hockey world by pulling off one of, if not, the biggest cheap-shot in the history of the game. Young, promising, gritty forward Steve Moore of the Colorado Avalanche was enjoying his dream of playing hockey. Entering his first full year in the pros, Steve was simply beginning his career that was gonna take him through his 20’s and hopefully carry into his 30’s. Well, Todd had other plans for him. March 8th 2004. It will not only be remembered as the night Todd Bertuzzi decided to pull the stupidest move in the world, but it will also be remembered by closer friends and family—and most importantly Steve himself—as the day that destroyed Moore’s life. The National Hockey League has spent the last couple seasons spending a lot of time speaking about one injury that has been taking over the game of hockey. As you may already know, we’re talking about concussions. The face of the game, Sidney Crosby, has been hit with concussion-related symptoms since the Winter Classic on new years day in 2011. Since then, he has played just eight games. David Perron of the St. Louis Blues missed 97 consecutive games due to a concussion after being hit by Joe Thornton. To be exact, Perron endured 394 horrific days due to that concussion that eliminated him from the lineup. Of course everyone already knows the story of Bruins forward Marc Savard, and to a lesser extent—Peter Mueller of the Colorado Avalanche. Putting all these cases into perspective lets take a look at Steve Moore now. We’ve now gone 2,922 nights since the incident took place. Almost three thousand days later, and the symptoms have yet to go away. There was once a time in 2005 where the symptoms started to wear off on Moore, and he was able to work out and run off the ice. However, things never got any better. March 8th 2012, Steve Moore is still enduring the same headaches, migraines, and symptoms he endured in 2004. His focus has shifted over these years from trying to get back into hockey, to just trying to live a regular life. Todd not only destroyed the young mans career, but he has affected Steve with every breath he takes. Every morning Steve wakes up and remembers that night. As hard as it may be to put a traumatic experience like that to rest, it becomes ever more difficult to do so when you’re feeling the side affects of it every day. Without getting into any more details about the incident that all of you have probably read about hundreds of times over the years, let take a look at the other side of the spectrum. Todd Bertuzzi. The man who was able to escape a year suspension (and the ban he should have received) has now topped off his career with over 500 more games added to his resume since that night where Steve played his last shift in the NHL. While he isn’t the same player he once was in Vancouver alongside Naslund, Todd has still found a way to get his autograph on a contract every year since the lockout. While he’s hovering around just 40 points year-in and year-out, he’s been blessed with the opportunity to play for great teams and franchises and has now played five consecutive years of playoff hockey as well. (six if you count the Red Wings run for the Cup this year). In 2007, during his first stint in Motown, Bertuzzi saw his Red Wings fall to the eventual Stanley Cup winning Anaheim Ducks in the third round of the playoffs. When the offseason rolled around, Todd signed on with the champs and spent that season playing for the Ducks—fresh off their championship run. That year, Anaheim entered the playoffs as the fourth seed, but was knocked out of the playoffs by the Dallas Stars in six games. Watching from the golf course, Todd saw as the very team he played for last season went on to raise the Cup in front of the sold out Pittsburgh crowd at Melon Arena. Flipping teams in a very Hossa-like fashion gave the Ducks and the Red Wings each a championship, but Todd came away with nothing. While playing for the Calgary Flames in 2009, those same Red Wings knocked out the Flames in the first round before returning to the finals and falling one goal short of a repeat. Once again, Todd was unable to smell Stanley Cup Final action while his former team came away with a golden opportunity to win it all. It was tough for Todd to go through those three seasons. Each year he played for great teams with Stanley Cup quality lineups, but he just seemed to be wearing the wrong jersey each time. He decided it would be best for him to return to Motown. Having watched as the Red Wings played two consecutive Finals series, it was an easy decision to return. In 2010, the Red Wings were able to get into the playoffs riding a hot streak to cap off the regular season. After eliminating the Coyotes, Detroit suffered a defeat to the hands of Joe Thornton and the San Jose Sharks. In 2011, it was as if déjà vu had struck Todd and the rest of the men in red. Knocking out the Coyotes in the first round before losing to the Sharks. Once again, Detroit went home early wondering what had went wrong. Lets flip over to the international stage for a second. Ever since the century mark, we have witnessed three great international hockey events that have taken place during the winter Olympics. In 2002, Salt Lake City watched as Canada took on the Herb Brooks-lead United States in the gold medal game. With a fantastic 2 goal, 2 assist performance from the always clutch Joe Sakic, Canada walked away as gold medal champions for the first time in 50 years. Four years later, the Olympics headed to Turin, Italy. Wayne Gretzky and his management team released the Canadian roster shorty before the start of the tournament. Added to this list was #44 of the Vancouver Canucks, Todd Bertuzzi. This instantly sent shockwaves through the nation, as fans around the country simply did not want to support the man who was able to escape suspension after the Moore incident. While millions called for Todd to be removed from the roster, Gretzky kept him there, and watched as Sakic and his roster were eliminated in the first round of the knock-out stage by Russia. Following that disappointing 2-0 loss, Sweden was crowned champions as they defeated Finland in the gold medal game. Bertuzzi once again walked home empty handed. Not even with a bronze medal in hand. Two years ago, Gretzky appointed Steve Yzerman as the executive director of team Canada. Yzerman was to put together a roster that had to accomplish nothing short of winning gold in front of the hockey-crazed crowd in Vancouver. With the golden goal going to Canada’s poster boy, and this generations Mr. Hockey—Sidney Crosby, Canada once again walked away with the gold medal after defeating the United States for the second time in 8 years. Sitting at home, Todd watched as one-by-one the Canadian roster received their gold medals. During the 2003 hockey season, Todd finished the year with a career high, 97 points. The season before that, he had hit 85 points. Todd was slowly making a name for himself as one of the leagues top power forwards. He was slowly getting his career shifted into All-Star status, and was well on his way to becoming a future gold medalist, Stanley Cup champion, and the winner of many possible awards and hardware. When March 8th 2004 happened, everything changed. Steve Moore suffered an experience that has altered his lifestyle forever. As he sits at home now, unable to fulfill his childhood dream as a professional hockey player, he watches as Todd continues to receive million of dollars playing hockey. However, when you take an even bigger look into this incident, things didn’t only change for Moore, but Todd started to noticed everything change for him as well. His career has shifted downward on a yearly basis since that very night. He isn’t the same effective player he was as a part of the Canucks. While the personal statistics are just one aspect of his career, the most important part of the game, the hardware, has been missing from Todd’s career as well. Todd can continue to play the game every night, but every year for him will continue to end in disappointment. The curse of Todd Bertuzzi has struck every franchise that he has been a part of. Over the last five seasons, the Detroit Red Wings have paid Todd money to wear their jersey and play hockey three times. During these very same five years, the Red Wings have been to the Stanley Cup finals two times. Guess which years those were? Yep, the two years that Todd was NOT a part of their roster. 2007, 2010, and 2011 have all been disappointing seasons for Detroit. Each of those years, Todd dressed for Detroit. The Anaheim Ducks, fresh off a Stanley Cup championship, entered the 2008 playoffs with home-ice advantage. After a 102-point regular season, the Ducks were riding high. However, they were ousted quick and early by the Dallas Stars. Their title defense came to an end in 12 short days. Bertuzzi was a part of that team. His curse hasn’t only affected the NHL, but it has also done its duties in International play. The last three winter Olympics has seen Canada twice win gold. These same three Olympics have seen Todd Bertuzzi represent Canada once. Guess which year he represented them? Yep, you guessed it again. Todd dressed for team Canada the one year they did not win it all (or even win any medal for that matter). Todd can continue making all the money he can while playing the greatest game on earth. He can continue to shift from team to team, sign contract after contract, and score goal after goal. The one thing that will never change is Todd will NEVER be able to mark his name into the game of hockey. His name will never be etched into Lord Stanley’s Cup, nor will he ever win any significant award or championship. Todd will forever be remembered in hockey by one thing—throwing the biggest cheap-shot in the history of the game. Great read, I didn't realize that he had missed out on the success of all those teams. Too bad for Detroit this year if the streak continues, because the rest of the organization from the top down is filled with pure class. I could never get my head around seeing him wearing the winged wheel. Seems almost sinful to have that man associated with that organization. I know he's gone through a lot, but he ended a guy's career in retaliation for a hit that probably still wouldn't draw a lot of heat from the league today. Watching that, and basically ever seeing Todd Bertuzzi or Marc Crawford's names associated with this game, makes me seek. Hater? What's not to hate, OilHorse!! !